Looks great! Using kale in this really caught our eye – we love kale. And it’d be easy enough to make it vegan with some Daiya “cheese” and just skip the sour cream. My tiny, plastic co-writers are already licking their chops. Thanks for posting. Yum! You’ve got a lot of my favorite ingredients in here, but I’ve never thought of putting them together for a fajita. Awesome idea! This is a great way to put that Kale to use! thank you for sharing this recipe! those look fabulous I LOVE guacamole! Thanks for the feedback. They are super easy to make. I was inspired by a refrigerator full of random leftover CSA veggies: tons of kale and sweet potatoes. As a native Texan, I find that tex-mex food is very forgiving. You can usually create tacos, quesadillas, fajitas, or enchiladas with any combination of vegetables. This recipe is especially versatile because you can easily remove the sour cream to make it vegan, or add grilled chicken, cheese etc. for a rather hefty fajita! You might be interested in some of my other tex-mex creations: https://cultivatingsustainability.com/2009/10/01/roastedvegetableenchiladas/, https://cultivatingsustainability.com/2009/11/02/sweet-potato-quesadillas/, and https://cultivatingsustainability.com/2010/06/26/mexicanpizza-garliccurls-summersquash/. Oh yum, that sounds really really nice! It really shows that you can put anything you like in fajitas! Maybe I’ll use the same principle soon enough. This looks great, how many servings did you get? About 6. But it all depends on how much filling you put in each tortilla. I was going to make garbanzo bean tacos tonight but I had garbanzo beans at lunch today so I was looking for something new. This has all the ingredients that I already have! Can’t wait to try it tonight! Thanks! 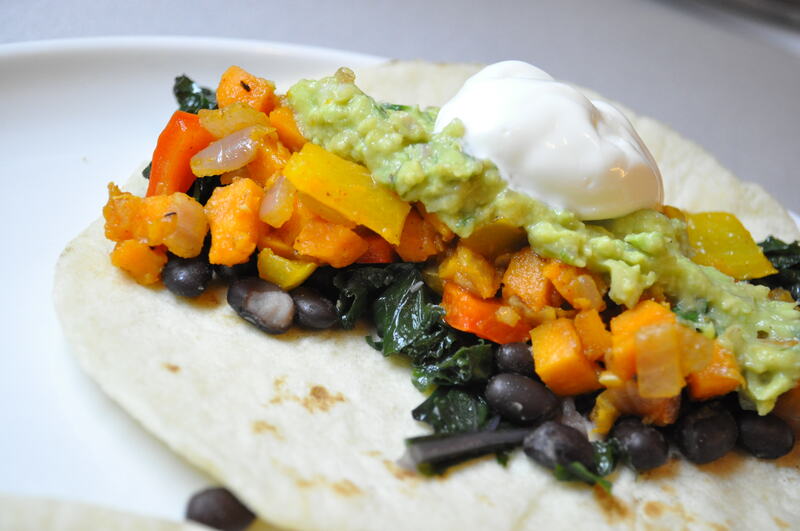 Pingback: Sweet Potato + Kale + Black Beans = Deliciousness! | Whats on Jen's Plate? I made these last night and they were delicious! I added 1 more can of beans to the recipe. But other than that it was wonderful! Thanks!